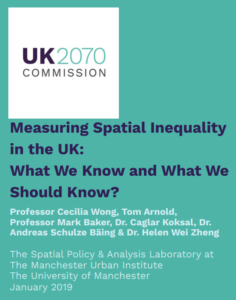 Written by a team of academics from The University of Manchester, the piece compares methods to measure spatial inequality, including the Gini coefficient and the related Luxembourg Income Study; the United Nations’ Human Development and City Prosperity Indexes; and the Inclusive Growth Monitor approach, created by the Joseph Rowntree Foundation and the University of Manchester. The paper offers a critique of these measures of spatial inequality, and assesses how the United Kingdom fares on each scale. The paper then looks at the spatial nature of the UK’s infrastructure investment and consider if this reinforces spatial inequality in favour of Greater London over the rest of the country. The report also considers if investment in infrastructure should be taken with a greater focus on the needs of society as a whole, rather than on an individual or population basis. Lastly, the report investigates if there is a need to adopt greater use of mapping analysis to better demonstrate the distribution of capacities and resources. Cecilia Wong is Professor of Spatial Planning at Manchester Urban Institute, and a Fellow of both the Academy of Social Sciences and of the Royal Town Planning Institute. She is Chair of the Economic and Social Research Council’s Research Approvals and Data Acquisition Committees and sits as a Commissioner for UK2070. Tom Arnold is a Doctoral Researcher at The University of Manchester’s School of Environment, Education and Development, researching transport planning and devolution in the North of England. Mark Baker is Professor of Urban and Regional Planning at the Manchester Urban Institute and a chartered town planner with previous professional experience at Durham County Council and at the Government Offices for both North East England and North West England. Dr. Caglar Koksal is a Research Associate and Lecturer in Urban Planning at the University of Manchester, with research interests including critical urban theory; political economy; infrastructure financing and funding; and public policy making. Dr. Andreas Schulze Bäing is Lecturer in Urban Development at The University of Manchester’s School of Environment, Education and Development with research interests in deprivation patterns and regeneration policies. Dr Helen Wei Zheng is a Postdoc Research Associate at the Manchester Urban Institute working on the ‘Eco-urbanisation: Promoting Sustainable Development in Metropolitan Regions of China’ project.